The butterfly has for centuries been depicted in Christian art as a symbol of the Resurrection. It is a sign of the believer's share in Christ's victory over death. As a very unattractive and earthbound worm, the little creature enters its cocoon for a deathlike sleep...then it bursts forth from it's "tomb." We witnessed this miracle on Easter morning. Ten minutes before leaving for Easter services, we watched this lady emerge from her "tomb." We nicknamed her "Easter" and released her after church. You can see more of my photos in my photopoint.com albums. Look at my caterpillars or butterflies, or you can also see my flowers and gardens. It's easy to attract butterflies to your garden, by providing their favorite nectar producing flowers. But if you want them to stay, you must also provide food for the babies (caterpillars) by planting host plants. Some female butterflies will lay their eggs only on certain plants, while others will choose a broad range of related species. 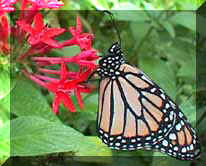 Monarch, for example, will feed only on milkweed, and the female will only lay her eggs on milkweed. Tiger Swallowtails caterpillars will consume many broadleaf trees and shrubs, especially willows and sweet bay. Butterflies need sun for warmth, so the best garden is planted in full sun. Naturally, the best host and nectar plants also love full sun (although they will benefit from some dappled shade in the hottest part of the afternoon). Butterflies also need water, so provide at least one puddle area for them. Wet sand, earth or mud are the best butterfly watering holes, butterflies cannot drink from open holes. You can make a watering station by adding sand to the saucer of a bird bath to reduce it's depth. Add a rock to the center that can act as a resting spot. You could also use a large saucer designed to fit under flower pots. Keep the puddle area in full sun. Usually, it's the males that will puddle. Let a few sunny areas in your yard go wild. Grasses and wildflowers native to your area are the best and most permanent butterfly draws. Try to include flowers that have a staggered blooming season, so you offer a steady progression of flowers throughout the warm months. 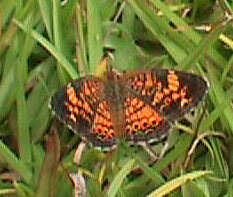 Mow the meadow areas only at the end of the butterfly season (November, in Fla) to avoid harming larvae. Enhance your butterfly awareness through personal observations. Learn which species already occur in your area and identify plants they are visiting. Go a step further and study the local butterflies and their preferred plants in more natural fields and forest settings. Many times, a 'weed' is the preferred host or nectar plant, instead of that exotic you've been babying all summer. An added benefit, is that natives will recover better from any damage the caterpillars may do to them. They are happier and healthier in their native habitat, more so than introduced exotics which often need special care. I think that, since the butterflies have been sipping nectar, and cats have been eating leaves, of native plants for hundreds of years, they will look for these same plants. They have to "learn" that this plant has sweet nectar or that plant will feed the babies. Most important of all, refrain from using insecticides and herbicides in your habitat. Insecticides don't discriminate - they kill bugs; ALL bugs. (Butterflies are beautiful bugs). Allow the 'good' bugs to aid you. Lady bugs will eat aphids, and dragon flies will eat mosquitoes. Also, try companion planting: Fennel is said to repel aphids, and it's a host plant, doing double duty in your garden. The Harvester is the only North American species who's caterpillars are carnivorous - they feed on aphids. Adult Harvesters are usually also found near aphid populations, ingesting the 'honeydew'. Many butterflies 'roost' in the weedy spots in your yard. Many caterpillar host plants are these very grasses that you are trying to kill. Try explaining the harmful effects of these chemicals to your neighbors as well. Didn't find what you need in my site? Or pose your question in my forum!